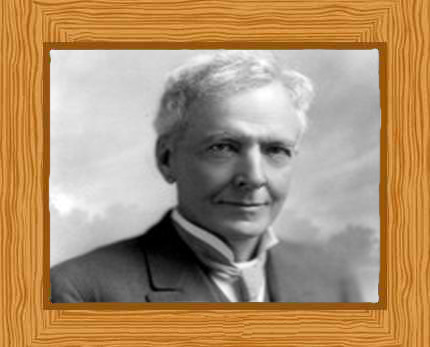 Luther Burbank is an America Botanist and horticulturist and one of the pioneers of agricultural science. Burbank developed over 800 plant varieties and strains during his 55 years in the field. He produced different fruit, grains, flowers, vegetables, and grass variations and also produced a variety of cactus that didn’t have spines that is mostly used to feed cattle. He also developed the “plumcot”,a fruit cross of apricots and plums. Some of his most well-known creations include the fire poppy, the Shasta daisy, and the “July Elberta” Peach. He developed the “Flaming Gold” variety of nectarine and the freestone peach. His russet colored Burbank potato, later called the “Russet Burbank potato”, is the most common potato used in processed food preparation. Luther Burbank was born on a farm in Lancaster, Massachusetts, on Mach 7, 1849. His parents had 15 children of which he was the 13th. He received a high school education and enjoyed the plants his mother grew in their garden and this may just be where he formed an interest in plants. His lost his father when he was just 21 and came into his inheritance. He used this to purchase a 17-acre farm located near the Lunenburg in Massachusetts. Here, he began plant breeding and developed the vaunted Burbank potato. Later on, he sold the rights to his potato creation for $150 which was considered a considerable sum during those times. He used this cash to move to Santa Rosa in California in 1875, establishing a nursery garden and farms. It was a few years later he developed the Russet Burbank potato and it became so famous that it is the potato most commonly used in fast food and for commercial use. In fact, this is the kind of potato used by McDonalds for their fries. When he arrived in Santa Rosa, Burbank bought a 4-acre farm and there he built his nursery and greenhouse. He also established fields where he conducted most of his crossbreeding projects. He was inspired to do so by Darwin’s work The Variation of Animals and Plants under Domestication.” He decided to upgrade and purchased 18-acres of farmland in Sebastopol in 1885 for an Experiment Farm which was near Santa Rosa. He named it Gold Ridge Farm. From the years 1904 to 1909, he was the recipient of several grants from the Carnegie Institution so he could continue with his hybridization project; he had the support of Andrew Carnegie himself. Some of Andrew Carnegie’s advisors were against Burbank since they believed his methods weren’t very scientific but Andrew Carnegie believed in Burbank and supported him. Through his plant catalogues Burbank became well-known. The most famous of these catalogues was the New Creations in Fruits and Flowers which was published in 1893. Satisfied customers were also responsible for his fame because they couldn’t stop from talking about him and the many wonderful things he could do with plants. Burbank was very prolific and developed an impressive number of plant varieties and hybrids. However, it wasn’t all smooth-sailing for Burbank because several members of the scientific community were quick to criticize him for not being more careful with his record-keeping. The scientific community is known for their meticulous record-keeping ways but as it happened, Burbank was more interested in the results rather than the methods and this explained why he was so lax with his records. For all his lack of record-keeping, Burbank was a very accomplished individual and made use of a variety of techniques in his work. In his experiments he made use of techniques like hybridization and grafting. He also dabbled in cross-breeding different kinds of plants and devised with the most fascinating products like the plumcot, a cross of apricots and plums. When it came to flowers, Burbank used the cross-pollination technique and selected the very best products to breed from. By all accounts, Burbank was a kind-natured man that was interested in helping people. He promoted education and gave money to many different schools. Though he was married twice, he didn’t have any children with either of his wives. His autobiography “Harvest of the Years” was published after his death in 1927. He died on 11 April 1926 after suffering a heart attack in March. Luther Burbank: His Methods and Discoveries and Their Practical Application, 12 volume set (1914–15), one of the first sets of books published using color photography. How Plants Are Trained to Work for Man, 8 volume set (1921).